WEST CHESTER, Pa. -- A mother from Pennsylvania is behind bars, charged with injecting two teenagers, including her own 14-year-old daughter, with heroin. 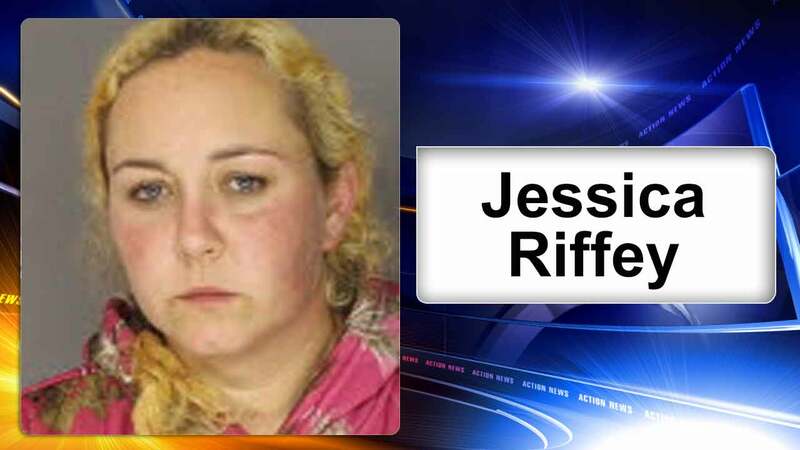 Jessica Lynn Riffey, 34, of Telegraph Road in Honey Brook, is charged with endangering the welfare of children, corruption of minors, drug delivery, and related offenses. Chester County District Attorney Tom Hogan said West Caln Township police were called to Riffey's home last Thursday to check on Riffey's 14-year-old daughter and a 16-year-old boy. The teens told police that Riffey supplied them with heroin and had injected them with the drug on several occasions at her home in September. "The victims described the defendant tying a string around their upper arms to extrude their veins, then using a hypodermic needle to inject the heroin into their veins," prosecutors said in a statement. "The victims also (allegedly) snorted heroin supplied to them by the defendant's boyfriend." Riffey was arrested and charged. She is behind bars in lieu of $50,000 bail. Prosecutors said Riffey's boyfriend, Jameson Burn, has been charged in a separate complaint with drug dealing and other offenses.